I am honored to be nominated by Soumya for the “Seed of Light” award. I love the name of the award and the idea that my words/poems can be a “seed of light” for another. Soumya has always been a “seed of light” for me since I started this blog. She is creative and has tirelessly dedicated herself to her blogs and writing. Over this past 15 months she has always used her kind and loving words to encourage myself and others. I am very touched and appreciative that Soumya continues to see good in my words. Please visit it at http://soumyav.wordpress.com and I know you will enjoy and grow through her wonderful post. Many blogs I follow are poetry, spiritual, and religious in nature from all over the world with many different cultural influences. All of these blogs bring to me a greater understanding of who I am within the loving embrace of God and with each of you in unity within the consciousness. 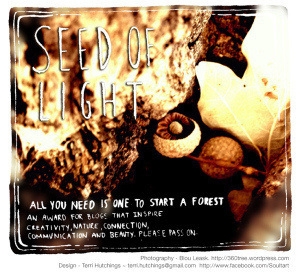 As a novice blogger I know there are thousands of blogs out there spreading “seeds of light” and inspiring thousands and millions of souls with their photos, art, music and words. At this time I have only dipped my toe into the sea of blogs. So today I choose to honor Soumya’s acknowledgement with a poem….called “Seed of Light” and I dedicate this to all bloggers who share in love their creativity and the lessons of their journey. floating to a barren land. bathed so lovingly by the rain. would think it may be. the seed is a speck…a sparkle…that ignites. is growing on your heart’s shore. A breath, a sigh, the light illuminates the soul inside. has great power to transform who you are. the gift of the soul to give. the Lord’s love into your heart and mind. that anchor you to Divine belief. Is a gift the Lord does give. May all your seeds shine in the glory of God’s light! Beautiful! You are very appreciated Mary. Congratulations Mary… You are an extraordinary point of light and bring much joy and clarity to the Universe! And the seed really is seen spreading the light around here. What a wonderful and divine poem to its name. Thank you Mary for the kind words and wish you continue to sparkle our lives with such lights.